This Cornish Cross chick is 18 days old. The group of 30 chicks is well into a second 50lb. bag of organic chick starter and I have bedded them out with a half a 3.25 cubic ft. bale of wood shavings to keep them clean. These chickens are not genetically modified organisms, but hybrids, selectively bred to grow quickly and efficiently. For a market that demands a plump bird with plenty of white meat, they have a proportionally large, almost featherless breast, atop very large, stocky feet. 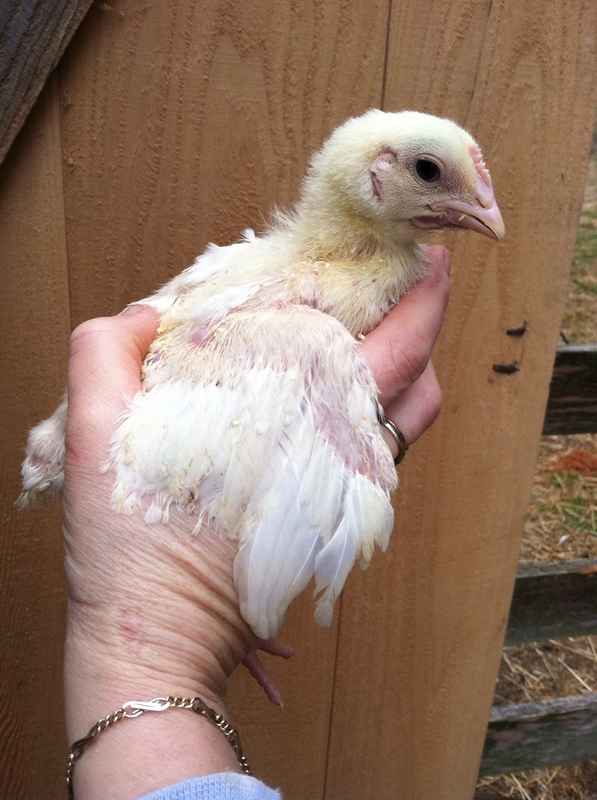 In many agricultural systems, a bird this age will be ready to slaughter in 24 days. On our locally sourced organic feed, without 24 hour light and grazing pasture in moveable, open bottomed pens, the chickens will be off the farm in around 52 more days. Yes the longer grow out time frame is less efficient at converting feed to meat, but the manure the birds deposit on our fields is very beneficial to pasture rejuvenation and the meat from these actively grazing chickens is firm, but not tough, and flavorful.